In 1847, the Madras Medical College instituted a professorship in Midwifery and the Government appointed the incumbent, Dr. James Shaw, as the Superintendent of the Hospital. Two new wings were added to the old building in 1852 but by the 1870s it was time to move. Laid out in the shape of a female pelvis, the new structure came up on Pantheon Road, under the guidance of Major General G.G. Gifford, who is commemorated with a block in his name on the campus. The new hospital was completed in 1881 in Egmore and by 1900 had expanded to five blocks with a total of 140 beds. The hospital was to be headed by several noted medical practitioners among whom was Lt. Col. A.M. Branfoot who in March 1886 successfully saw the imprisonedex-Queen of Burma – Supayalat – through a difficult delivery. The Maternity Hospital, or MH as it came to be known, was the only one of its kind in this part of India for several decades. 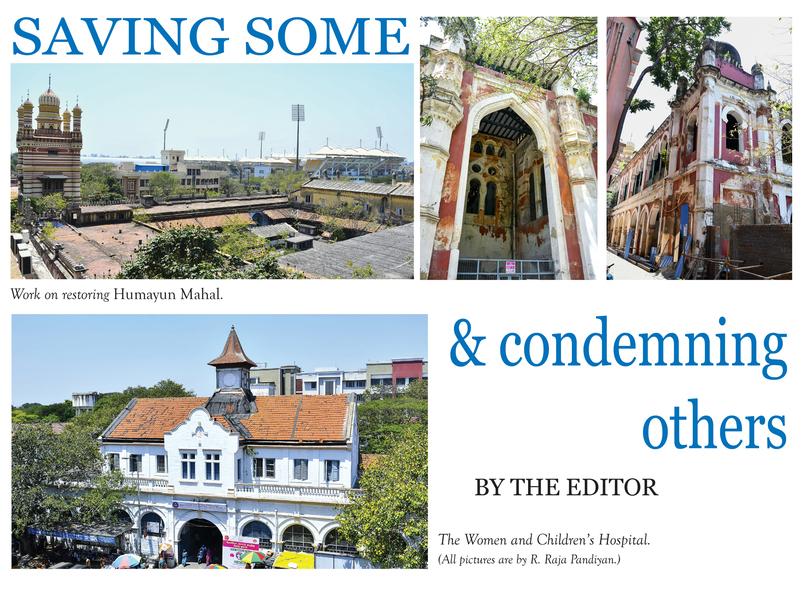 It was in that capacity that it hosted the first All-India Obstetrics and Gynaecological Congress in 1936.A children’s ward came up in the hospital in 1949 with 28 beds. In 1963, the Government sanctioned a separate hospital for children and this came up in the Arni House compound. When completed, this became the Government Children’s Hospital, with 250 beds. The hospital became a teaching centre with postgraduate and diploma courses under the Madras Medical College. In 1952, it became one of three postgraduate institutes of Madras city, and that marked the beginning of the Institute of Obstetrics and Gynaecology at the MH. Dr. R.K.K. Thampan was the first Director. The hospital is today a recognised centre of excellence and delivers around 22,000 babies annually. The campus has seen several new constructions but the oldest block has remained wilfully neglected. Large sections of it have remained closed and a small portion now serves as an outpatient department. With lack of even the most basic maintenance, the building presents a derelict appearance. That in turn has made it easy for the Government to obtain a demolition certificate. It is not clear if the Heritage Conservation Committee of the CMDA has been consulted in the matter. This is now more or less a mere formality with several structures having been given the nod for demolition by this august body. No thought has evidently been given to whether the structure could have been renovated and adapted for reuse. Ever since the P Orr & Sons case, when the High Court questioned the locus standi of third parties filing litigation regarding demolition of heritage buildings, the Government too has become careful to rule out any such possibilities. In the present instance, a statement by the Minister concerned has it that the demolition of the main block, and a sanction of Rs 15 crores for the construction of a new building in its place, has been at the request of the doctors working at the hospital. With that, the fate of the building is now more or less sealed and the city will lose yet another heritage landmark. Posterity will decide on whether the doctors were correct in their request.